What specifically about the mission of MPFI resonates with your own passions as a scientist? Max Planck excels in the high magnification instruments and electron microscopes that can now see below the molecular level. The work that is happening in neuroscience now with the ability to actually see dendrites and watch neurons firing is incredibly important. The beautiful pictures obtained from these microscopes are helping scientists understand just how our bodies work. Why is it so personally important to you to support scientific research-based organizations? I have Alzheimer’s disease, and I’ve become more public about it because the cost to our nation is well over $200 billion dollars a year now in terms of caretaker costs. The economic value of this caregiving results in an average of 20 hours of unpaid care provided per caregiver each week. This translates into time missed from paid employment and further amplifies the financial strain and emotional stress placed on families caring for loved ones with Alzheimer’s. I’m very supportive of the fundamental work that Max Planck is doing in terms of trying to understand the basic ways the brain functions, gaining insight to fight this disease. As major community philanthropists, how would your family like to see other individuals support the scientific research and work of organizations like MPFI? I’ve tried to make our gifts an example for others. It’s important for local philanthropists to attend events hosted right at MPFI’s facility so they will be able to see firsthand the work the scientists are doing in their labs. Alex Dreyfoos’ connection to science and artistic expression is longstanding. He graduated from Massachusetts Institute of Technology (MIT) before serving in the U.S. Air Force in Germany where he managed a photographic reconnaissance laboratory. He later earned an MBA degree from Harvard Business School. In 1963, Dreyfoos founded Photo Electronics Corporation, where he invented the Video Color Negative Analyzer (VCNA), marketed worldwide by Kodak and now part of a permanent exhibit at the Smithsonian Institution. A motion picture version of the VCNA earned his company an Academy Award from the Academy of Motion Picture Arts and Sciences. He holds 10 U.S. patents, is a lifetime trustee of the MIT Corporation, and a fellow of the American Academy of Arts and Sciences. He owned WPEC TV-12 from 1973 to 1996. 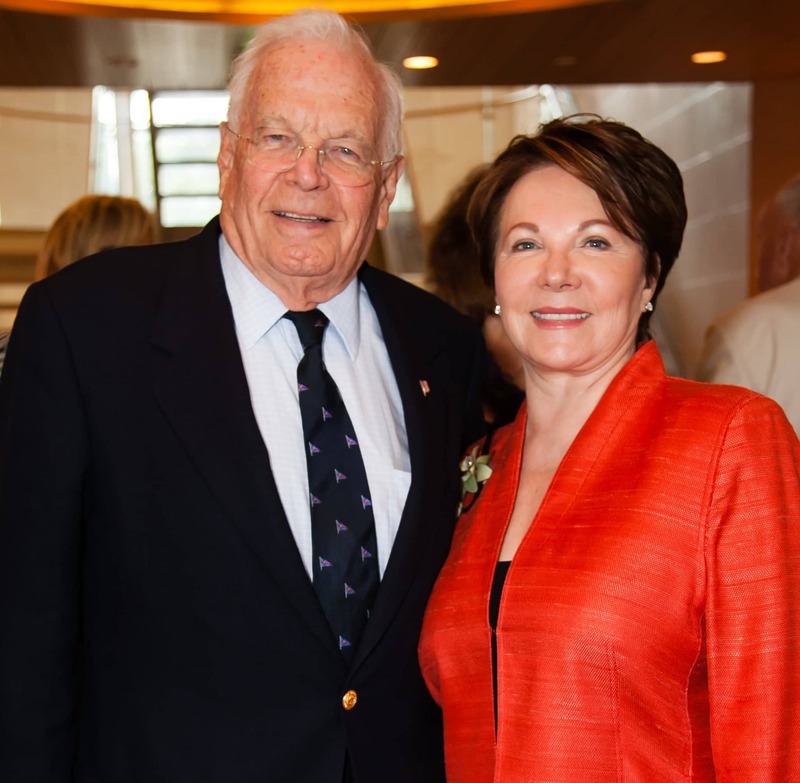 The West Palm Beach philanthropist and his wife, Renate, are well known for their leadership roles in establishing the Cultural Council of Palm Beach County and the Raymond F. Kravis Center for the Performing Arts, as well as supporting The Dreyfoos School for the Performing Arts. Dreyfoos confided that his primary motivation for taking the lead on establishing a world-renowned arts center in our region was initially a selfish one. He wanted to attract great talent and leading institutes to the area. The couple’s leadership in the arts started a domino effect. Next, his hope was that scientific researchers as well as the talented people who assist them would eventually make their homes in Palm Beach County. Dreyfoos completed a term on the Board of Trustees of The Scripps Research Institute. He is currently an active trustee on the Board of the Max Planck Florida Institute for Neuroscience. “The Institute’s presence here puts Palm Beach County on the global map of scientific achievement, which is dear to my heart and interests,” shared Dreyfoos when he designated the gift to Max Planck Florida Foundation. “Max Planck is important to our economy and educational resources, but most importantly it is moving us closer to cures for Alzheimer’s, autism, Parkinson’s, and other diseases of the brain. What could be more important than that?” he challenged. The Max Planck Florida Foundation received a generous $1 million gift in March 2014 from Alexander and Renate Dreyfoos. In honor of the couple’s gift, the central atrium at the research institute has been designated the Alexander and Renate Dreyfoos Atrium.